In this show, Dr. Kemp will cover the first step of eight steps to well-being in the book and discuss: What’s the Matter? – and why people see themselves as sick and defective versus as just simply out of alignment with the fullness of their being- mind, body and spirit. She will share what she calls the energy-basis of mental and emotional issues and assist listeners as well as those going through the 8 Steps of the book, with redefining their symptoms and offer solutions based on metaphysical and spiritual principles as she exposes what went wrong that got people out of alignment in the first place. Going to the core of the matter, she discusses how dis-ease is created and the universal laws of creation. She further shares her opinion of why many have minimized these laws and the nonphysical aspects of their being which reduces the fullness of who they are. This leading edge perspective has already helped many people to view themselves and their symptoms from an alternative and holistic point of view that’s brought about tremendous relief. View testimonies here. You are also invited to call in during the show to ask a question or make a comment. Or you may send a question about the holistic and alternative healing offered in the book or a particular mental or emotional diagnoses that you or a loved one may have, and Dr. Kemp will offer her re-interpretation of it for you from the Sacretherapy® perspective from her book: From Psychotherapy to Sacretherapy® - Alternative Holistic Descriptions & Healing Processes for 170 Mental & Emotional Diagnoses Worldwide, right here on the show. The number to call is 1-347-677-0795 or use the form at the website above by clicking the radio show link. 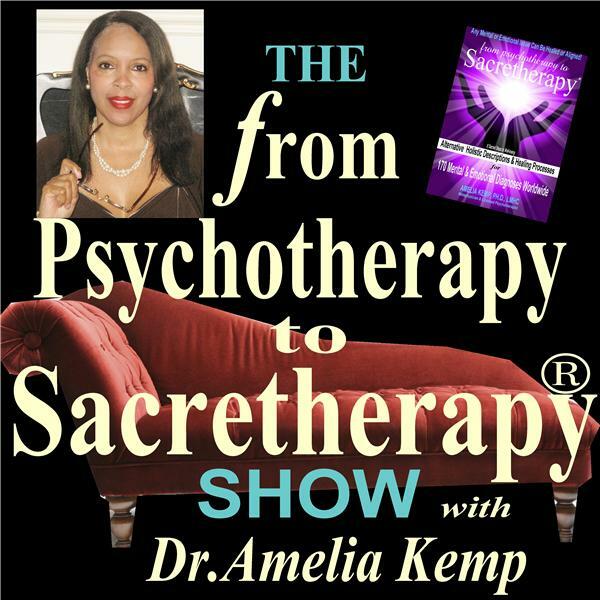 While there, sign up for the weekly podcast and get a free relaxation and meditation cd by Dr. Kemp.